Nephin is a problematic name and few sources venture an interpretation. 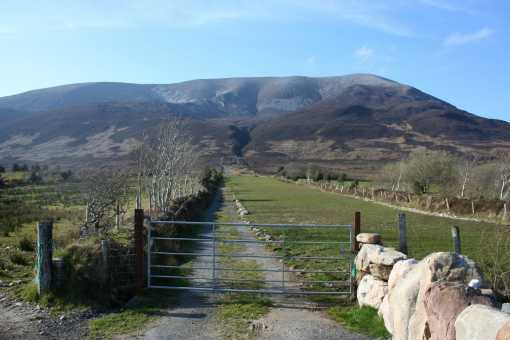 It is mentioned as one of the twelve great mountains of Ireland in Cath Maige Tuired (The Second Battle of Moyturra), where it is called Nemthenn. This is suggestive of nemeton, a Gaulish term for a sacred clearing in a wood or sacred grove. The word recurs throughout the Celtic world, from the Galatian Drunemeton ('sacred oak-grove' in modern Turkey) to Nemetobriga in Spain and Aquae Arnemetiae, the sacred spring at Buxton in Derbyshire. The Old Irish fidnemed refers to a shrine in a forest. [Barry Cunliffe, The Ancient Celts]. There seem to be no survivals of traditions connected directly with Nephin to confirm this. However, Nephin's much lower neighbour Tristia (322m, 4km to the NW) was the site of Lughnasa celebrations until recent times [Máire MacNeill]. Glen Nephin is the only example of an Irish glen (apparently) named after the mountain overlooking it. Walks: for a route to the summit from the E, see Whilde & Simms, New Irish Walk Guide - West and North, 69. Nephin is the highest mountain in the North Mayo area and the 37th highest in Ireland. Nephin is the second highest point in county Mayo.